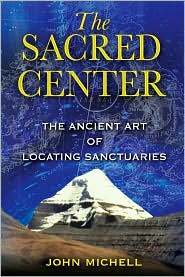 The Sacred Center by John Michell, is a fascinating and educational book for those looking for sacred ground. The book covers both ancient and modern sacred sites. The book also describes the history behind the sacred sites and includes illustrations and maps of sacred locations. Descriptions of rituals and symbolism are also included in this book giving the reader a greater understanding of locating sacred sites. Overall the book is an excellent source of historical sacred sites and rituals. On the negative side this book is not for beginners, its terminology is advanced almost theological in content. Without some prior background and knowledge of sacred sites and rituals the reader will have a difficult time following along.